The Davidoff MB Petit Corona is a perfectly hand rolled cigar with Dominican filler and Ecuador wrapper, of 4.5” x 41 size; a full bodied smoke. AGED CIGAR ALERT: This is a vintage cigar from 2007 with limited availability. Being the shortest from the Millennium Blend series, the Petit Corona is actually the strongest stogie of the Series, with smoothness and spices notes in its flavor profile nevertheless. 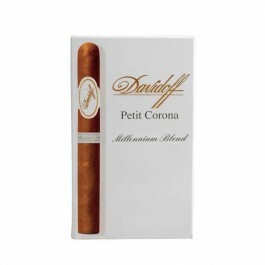 Its short smoking time, 25 minutes, makes it a great pick for both the experienced smokers and the novices. These cigars come in 5 packs of 5 cigars.